Description: The colourful male’s head and neck are green with a white ring around the neck and a metallic green crown. The face is bare of feathers but has bright red wattles. The breast is maroon to copper with black tips and the rest of the body is a pattern of browns, rusts, blacks and creams ending in a long pointed and barred tail (45 cm/18 in). The female is less conspicuous mottled mixture of browns, blacks, greys and creams. Her back has black spots while her breast is a buff colour. Ring-necked pheasants weigh 1-3kg (2-6.5lb) with a wingspan of 56-86cm (19.5-27.5in). Females are smaller than males. 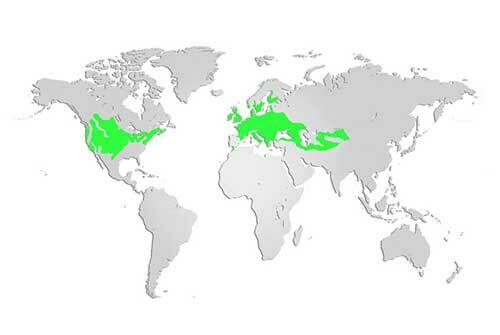 Distribution and Habitat: Several species and varieties of game bird were intentionally introduced to North America in the 1700s and after inter-breeding in the 1800s the Ring-necked pheasant population was well-established by the 1900s. In Nova Scotia, the main population was centered in the Annapolis Valley with the first hunting season in Kings County in 1943. Today the pheasants range throughout the mid-western and northeastern United States, across the southern prairies of Canada and are very common in Nova Scotia and southern New Brunswick around cultivated agricultural land. Diet: The main diet of Ring-necked Pheasants is seeds and grains as well as some fruits, nuts and insects. Life Cycle: Breeding season begins in May with males establishing territories where they crow, fight and display to attract several females. Females construct a simple nest on the ground in a grassy area and begin laying one egg a day until they have 9-15 eggs in their clutch. Incubation lasts for about 23 days and the young can fend for themselves after about 3 months. Did you know? 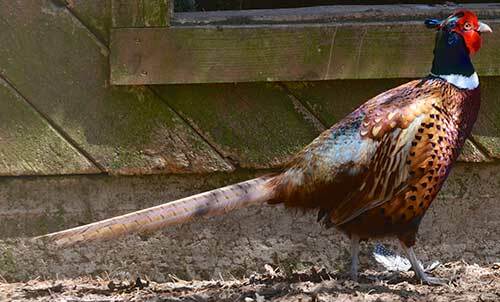 This large pheasant is the result of a blending of Chinese, Korean and Manchurian ring-neck pheasants.